Lessons learned. Or are they? Sophie, who knows that I'll give her THAT LOOK, continues to roll. She careth not and never learns - that's the good thing about being a dog. Learning over and over again can be a good thing - something you continue to be amazed to learn OR the result of a bad thing - from years of experience, like Sophie and her habitual rolling. The lesson I keep learning over and over again is __________. Okay, your turn. Tell me what you've learned. that is the funniest photo..
( sorry) marked dog..then i fell out laughing when i saw the big picture, not ugly at all ,just had a party suit on...dogs are the best. what i learn over and over..
life is easier if i'm organized. haha! love that! and amen - you are so right. Hee hee, just needed to voice my appreciation for the photo (and the relief that my pupper usually just rolls in grass)! For me? It's that I feel better when I exercise. I know that. I've proved it over and over again... and yet I still let the "don't wannas" get in the way constantly. D'oh! At first glance I thought the poor thing had porcupine quills all over her! Thank God she doesn't! Being cute lets you get away with anything. Love the photo and what did she roll in? My lessons, I have two. 1. when my kids ask for a hug, always stop and give it to them. I always feel better afterwards. 2. exercise - I never regret doing it and feel better afterwards. FYI: for those who asked. 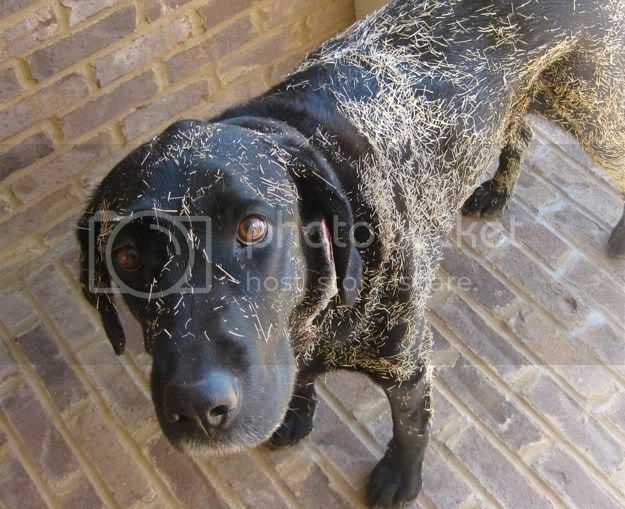 She rolled in dried bermuda grass - more or less every day last fall. It wasn't as bad as it looked, except that it needed a hair dryer to clean and she's terrified of hair dryers - so that was a fun experience. I'm going to add mine. The first thing that came to mind was how good I feel when I exercise, yet I never want to do it. When you eat icecream in the evening your tummy hurts in the morning... ooooooohhhhhh.......how does one resist Brown Cow from Tillamook??? I've learned I repeat stupid parenting mistakes more than I'd like to admit, but when I get it right the problems don't come back. Hahaha - how could you be mad at that face ??? I have learned it's best to hold your breath and count to three.....especially with kids animals and husbands. My lesson is that the slower I go the faster I get there. It sometimes frustrates me but always works. She must have had so much fun. That photo is a hoot. The lesson that I learn over and over again is that I feel so free when I just go ahead and do what ever it is that I dread. Of course I relearn it only after putting it off as long as I can.